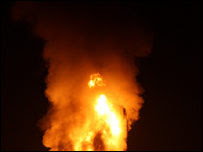 A huge explosion and fire have hit a gas pipeline outside the Russian city of St Petersburg. There were no reports of deaths or injuries and officials said they did not suspect an act of terrorism. The main pipeline for Russian gas lies well to the south of the blast, but a pipe supplying Finland is nearby. Witnesses said the massive explosion, at just after midnight on Wednesday (2000 GMT) in St Petersburg's northern suburbs, shook buildings several kilometres away. How do they know whether or not to suspect an act of terrorism? Does it depend on how much they want to frighten us? A series of explosions at a gas facility sent flaming debris raining onto highways and buildings near downtown today, injuring at least three people. Authorities evacuated a half-mile area surrounding the Southwest Industrial Gases Inc. facility and shut down parts of nearby Interstates 30 and 35 as the explosions continued for more than half an hour. Video footage showed numerous small fires burning in the area as stacks of gas cylinders exploded. 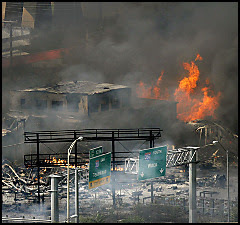 Three hours after the explosions started, fire crews were hosing down the charred metal wreckage. About a dozen cars in a parking lot and a grassy highway median were damaged. Fire Department Lt. Joel Lavender said the explosions started around 9:30 a.m. because of a malfunctioning connector used to join acetylene tanks during the filling process. And how do we know that faulty connector wasn't Islamic?